After using more than 20 window manager apps on my Mac, I came back to BetterSnap Tool to use as my personal tool. Although it received a tough competition from our second and third place apps, there are certain features which gave BetterSnap Tool an edge over the others. Firstly, you can use both trackpad and keyboard to interact with the app. You can drag an app window in either of the four corners to resize them in a quarter of the screen size. 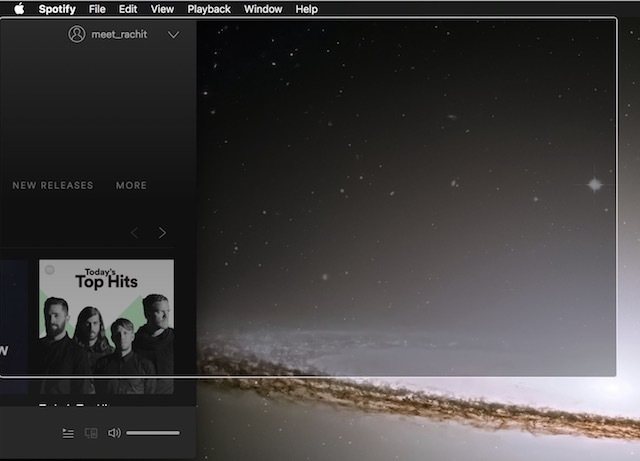 To initiate split-screen mode, just the drag the app window to the sides of the display. Dragging it to the top will make an app go full-screen. 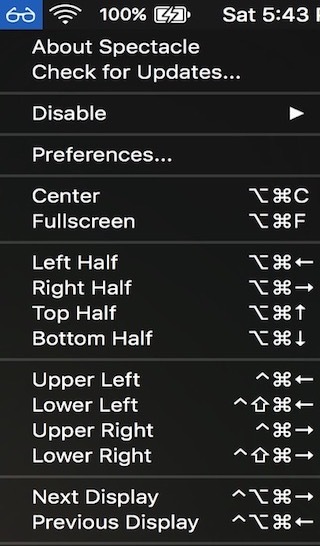 The same configurations can also be achieved by hitting the user customizable hotkeys. One of the major features which are lacking in other apps on our list is setting up customized snap areas. Basically, users can predetermine the size of the app window and assign a designated area to which the window will be snapped. There is no restriction while designating the area and the size of the app window. This is a very handy feature to have as you can set the window size as per your preference. 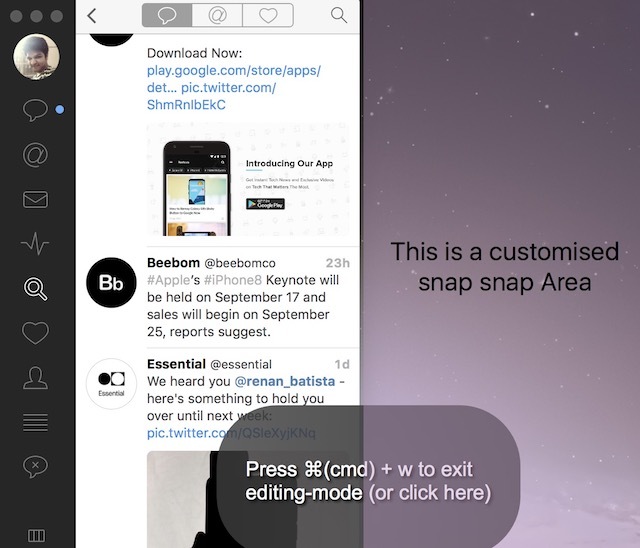 This feature along with its snappy performance took BetterSnap Tool to the top of our list. Magnet is the most reliable and snappiest window manager app of all the apps I tried. You can use both keyboard shortcuts and trackpad to resize your windows. An app window can be resized in the top, bottom, left or right halves or to a quarter of your screen size in either of the four corners. The only reason it did not top our list is the absence of the ability to customize the size of the app window. However, one thing which goes in its favour is that it is more affordable. If you are looking for a high speed and accurate window manager, this will be your best bet. Spectacle is an open source window manager app for macOS, so it’s completely free. Don’t be fooled by its price, as it goes head to head with our top pics. However, there is one missing feature which can be a deal-breaker for some users. 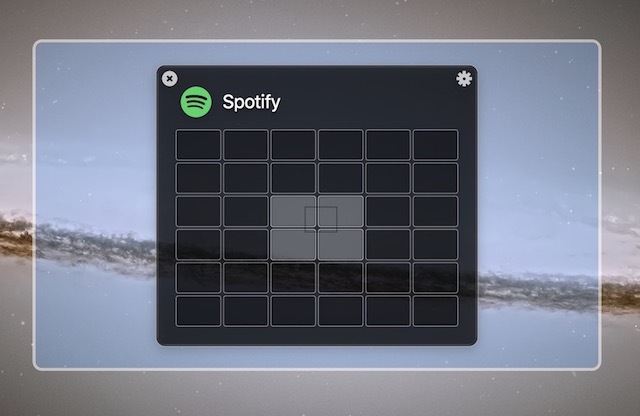 Spectacle only lets you resize the window using user customisable keyboard shortcuts. There is no drag and drop feature to resize your windows here. However, you will not make any compromise in speed or accuracy while using this software. If you are looking for a free app which helps you manage your windows, this is the one for you. Window Tidy’s approach of managing app windows is a little different from the top three picks on our list. When you hold an app window to drag, it gives you the option of different sizes and position of windows at the bottom of your screen. You can drag the app window to your required option to resize the app window. It even allows you to add your own custom sizes and positions. One missing feature is the exclusion of keyboard shortcuts to arrange your windows. However, it is one of the better tools if you want to use drag and drop feature to arrange your windows. This one is for the power users who manage multiple windows at the same time. You activate the app’s interface by hitting a user customisable hotkey. Then you can select any number of app windows you want to arrange and then select their positions. You can even add custom sizes and positions. The only drawback is that it takes some time to select the orientation you want. Having said that, if you want to manage multiple windows, this is the best app for you out there. It has a free trial period, after which you will have to buy the software to use it. Mosaic is similar to Window Tidy but the only difference is that it gives you the window resizing option at the top of your screen instead of at the bottom. It also let you assign your custom spaces and sizes. In my opinion, it is even better than Window Tidy. There are default configurations. You just need to drag and drop a window in the right spot to arrange them. Hitting the right window does require a little more precision, as the window options are tinier. 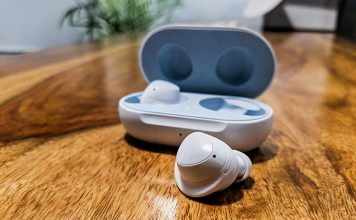 Also, it is priced on the higher side and the features it adds does not justify its price. 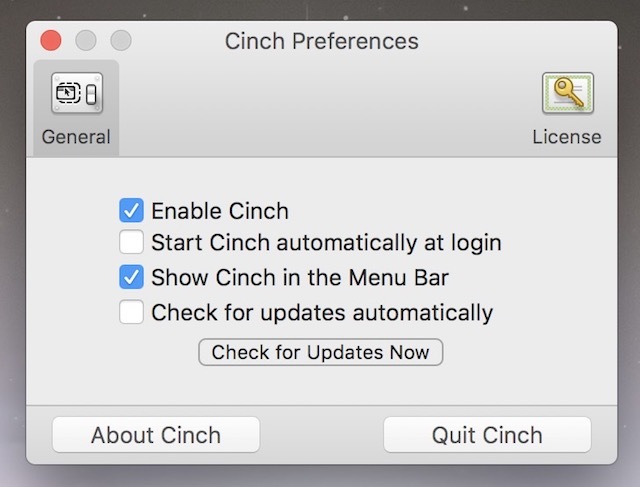 Cinch is a window manager app for Mac which is not heavy on features. It only offers three window resizing positions, left and right halves and full screen. However, it does that well. The app is very light and snappy. It is useful for people who do not want to remember custom hotkeys and want something which is simple and just works. You just drag and drop an app’s window to the left and right side to activate split screen mode. Dragging it to the top will make the app go fullscreen. The only problem is that for what it offers, the price is too steep. If you have a problem remembering keyboard hotkeys and find dragging and dropping windows to arrange them a little cumbersome, this app is for you. You only have to remember one keyboard command which launches the app’s interface. The interface shows you a cheat sheet of commands along with their function. You don’t have to remember anything. One neat feature is that if you want to arrange an app’s window in such a way that it takes more than half of the screen, you can do it here. 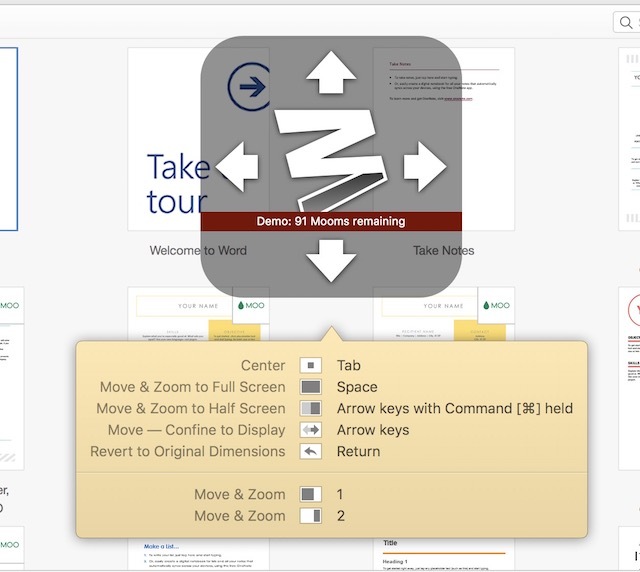 Just use Move & Zoom feature mentioned at the bottom of the cheat sheet. If you like instructions, try this one out. Divvy offers a different approach to window resizing and charges a hefty price for that. 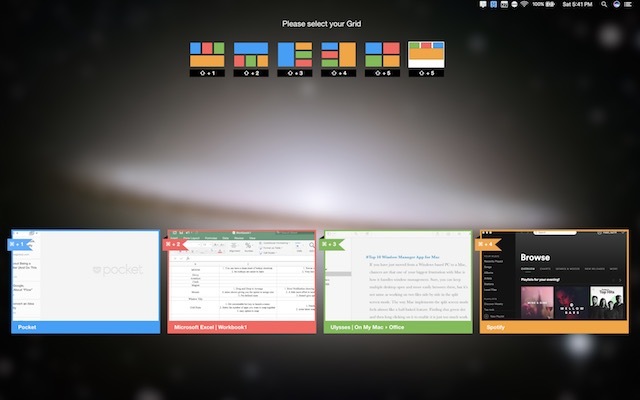 When launched, the app interface is just a grid of squares which represent your desktop area. You can select an app and then select the squares to position your app in that area. However, this does make the process very slow. Also, managing multiple windows is a pain, as you have to select the apps individually to resize them. This app is best for people who are looking for an app which just lets them resize their app’s window and don’t necessary need to multitask. Amethyst rearranges the app windows automatically without any input. The first app is launched in full-screen mode, the second makes it half and so on. 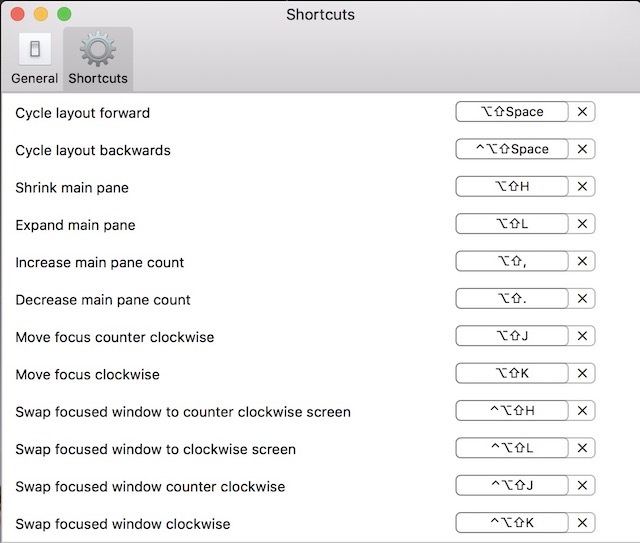 You get a keyboard shortcut to rotate between different arrangements and that’s it. In my usage, I have found that it works well till 3 apps are open. After that, it short of gives up and the app windows start to overlap on top of each other. Amerthyst is a little bit different and hence not suitable for everyone. It is either for someone who always works on multiple windows on the same desktop or for one who is just too lazy. Window snapping is one of the most sought after features by Mac users. Although Apple has included a window snapping feature, it is not intuitive and easy to use. Well, that’s where the aforementioned best window manager apps for Mac come into play. These apps will help you make your window snapping game strong on the Mac. So, go ahead andd download the one which suits your need and get started. Do tell us if you like our list in the comment section below.